Anyone have the M4 exhaust? Anyone have the M4 exhaust? Hoping to see a picture of it from the rear. Can't seem to find one. Would also love to hear your thoughts on it. I am interested in this also! Just called M4 about the pipe as I too am interested in it. I was told the 100db @6k rpm claim is WITH the Q7 quiet insert and without the insert the increase in sound should only go up 3-4db. Not bad for a decat on this bike! That really looks awesome! I ended up going with the black aluminum Arrow. 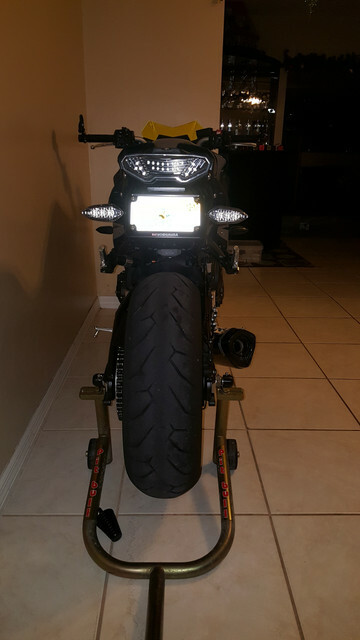 I was curious, what fender eliminator kit did you install? It looks really nice. The fender eliminator is by Yoshimura. Thanks for sharing your pics. It's a little hard to tell, but does the exhaust stick out further than the footpegs? Curious if there is any concern with dragging it at full lean. Well, I called M4 this morning. They assured me that this exhaust was designed while taking lean angle measurements into consideration, and I shouldn't worry about it touching the ground unless I drop my bike. Seemed like really nice people and took the time to answer a whole slew of questions that I threw at them. I also watched the below video and found in the comments someone asking whether the pipe would drag, and the response seemed fairly doubtful that it would. So, I went ahead and placed an order!! 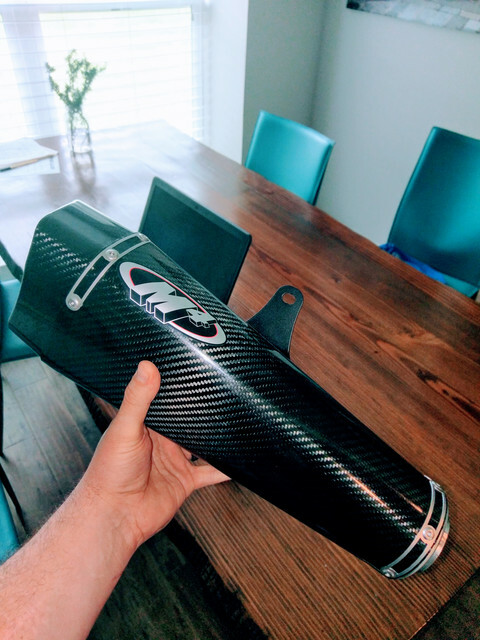 Cantaloupe margs and carbon fiber! The MT is going to sound beast!!! 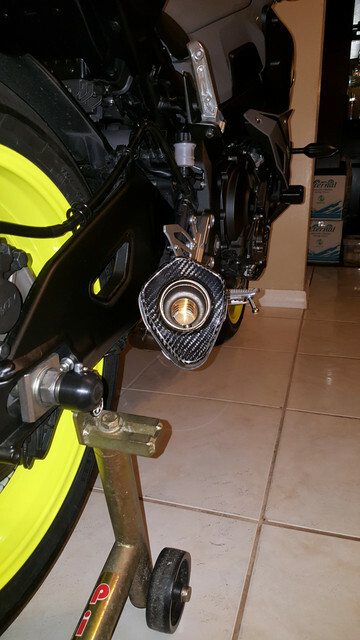 I bought the M4 not more than a week ago, install went well, noticed the actual end can mounting hole didnt quite match up with its mounting point on the bike? Needed a little persuasion, seems very solid now. Amazed at how well the bike runs without any extra tuning so far. Not a great deal of popping on decel or any flat spots or weird behaviour of any kind. I've left the sound insert in, and its plenty loud, on the verge of too loud for my taste. 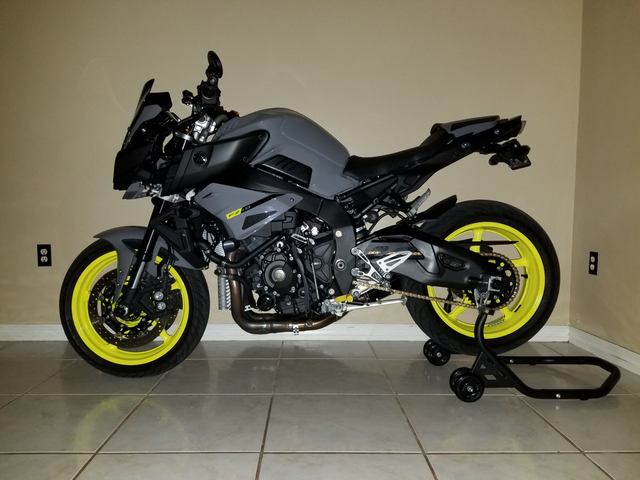 Definitely the best sounding and loudest bike i've had, so maybe it takes a little adjustment. 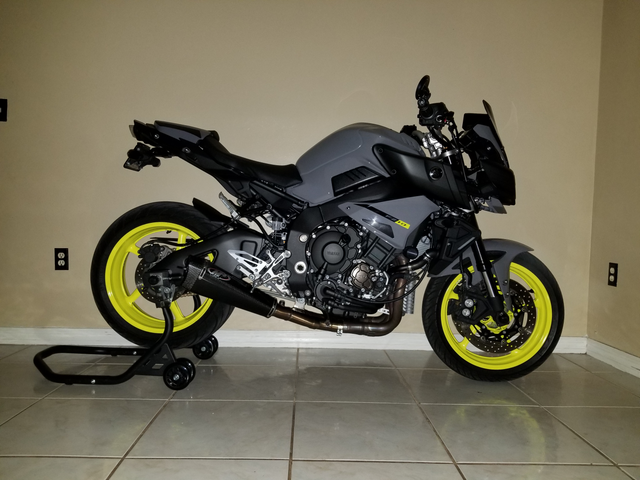 Little drone at highway speeds, will definitely need to be more diligent with the earplugs when i take this thing touring. All in all very pleased, especially at half the price of an equivalent akra setup. I found the install to be seamless and the fit/finish to be excellent. 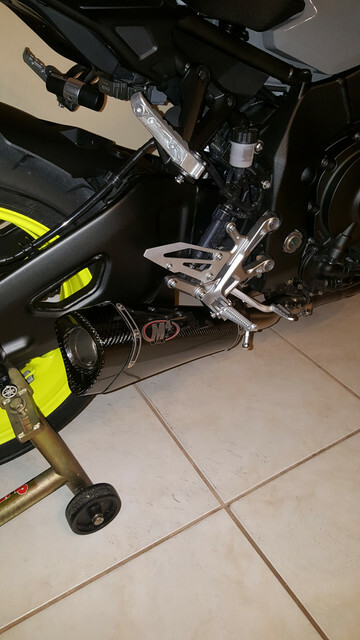 First, I loosely fitted the midpipe and muffler, then I hand tightened all bolts/nuts. The pipes do seem to have a "spring load" to them which required slight down force to install hardware, but I think that is intended with the design. The idea is to work from the front to the back with each step. After loosely connecting everything, I went back with Loctite and a torque wrench. I spent more time admiring the setup (.... AND SOUND!!) than trying to install. Has anybody found a good sound clip for the m4 exhaust? I only was able to find two on youtube, one was the dyno video and on the second video the person doesn’t really rev it up. I was hoping to find one where somebody is riding around town with it. Here's my short clip. This is without baffle. Really loud. With baffle is perfects. Will have to munt the gopro and ride around for better sound. Did you ever get around to the 'ride around' video? How about a sound clip with the baffle in? ?